The River Kingdom is a tranquil oasis of ancient knowledge. It is a festering cesspit of corruption. It is a well-governed and harmonious land with a special place in the world—and its shadows are filled with ancient terrors. As a land of opposites and millennial histories, Nuria Natal is difficult to pigeonhole. Its people are powerful and its priests and wizards especially so. Despite a dozen major attempts at conquest, the people of Nuria Natal have turned back the draconic tide, in some cases with ease, in others with a narrow margin and major losses. Its defenses are robust, and the people’s pride in their knowledge and achievements gives them a confidence that others mistake for arrogance. The defenses of Nuria Natal are based on the nation’s close relationship with its gods. Aten, Horus, and Bastet are not figures worshipped from afar; they walk the earth when called, and their power has thrown the Mharoti dragons back in confusion several times. However, the gods are fickle, and on many occasions they have refused to answer the entreaties of mortals. In these cases, the people resurrected some of their ancient kings, powerful heroes whose bodies had lain under the sands and in step-pyramid tombs for ages. These restored rulers led several brilliant defenses of Nuria Natal against the dragons. Afterward, though, the reborn rulers chose to stay and reassert themselves in Nurian politics. This has been awkward, to say the least, for the current king. Nuria Natal is the home of the Southern Tongue, which seems especially suited for use in magic. Some spells and incantations known in the south are somehow never translated into Common, Northern, or Draconic speech. The current god-king, Thutmoses XXIII, is a somewhat besieged and worried man of middle years, with a prominent nose, shaved head, and a glorious beard woven with gold and mithral. Seven of his kingly ancestors have been awoken from their tombs to defend the land against the Mharoti dragon-armies, and his own power has been eroded. One of the kings returned to his tomb beneath the great step pyramid, two were slain in battle with the dragon lords, and four still wander the kingdom: Queen‑Goddess Meskhenit, God-King Set-Amun, God‑Wizard Kuluma‑Siris, and God-King Sut‑Akhaman. The most obvious sign of this erosion is the increasing independence of Per-Xor and Per-Bastet, both of which still render tribute and troops to Nuria, but with increasingly loud complaints and a sense that perhaps the current god-king does not measure up to the standards of his illustrious ancestors. Magic is everywhere in Nuria Natal. Powerful ley lines course through the land, allowing geomancers and wielders of hieroglyphic magic to harness and manipulate their arcane energy. Other wizards have mastered the mysterious Red Portals, using them to travel to other places, dimensions, and times, while the unpredictable catslide alleys provide the means to journey swiftly from one cat-friendly city to another. Ley Lines The story of Nuria Natal is inextricably bound to the mighty ley lines that run through the kingdom. Five thousand years ago, when the seven founding human families gathered on the banks of the River Nuria at the end of their long journey, the wizard Senewosret sensed the powerful arcane energy flowing through it. Realizing he could tap into the ley line that ran along the river’s entire length, Senewosret ordered a new city to be built on its banks. For the next five millennia, the wizard-kings and sorcerer-queens of Nuria experimented with the ley lines and the magical waters of the river, using them to extend and prolong their lives until they unlocked a sort of semidivinity and were able to develop rituals through which they could be awakened from the slumber of death to aid their descendants. The titanic ley line running the length of the River Nuria is known as the Angel’s Road. 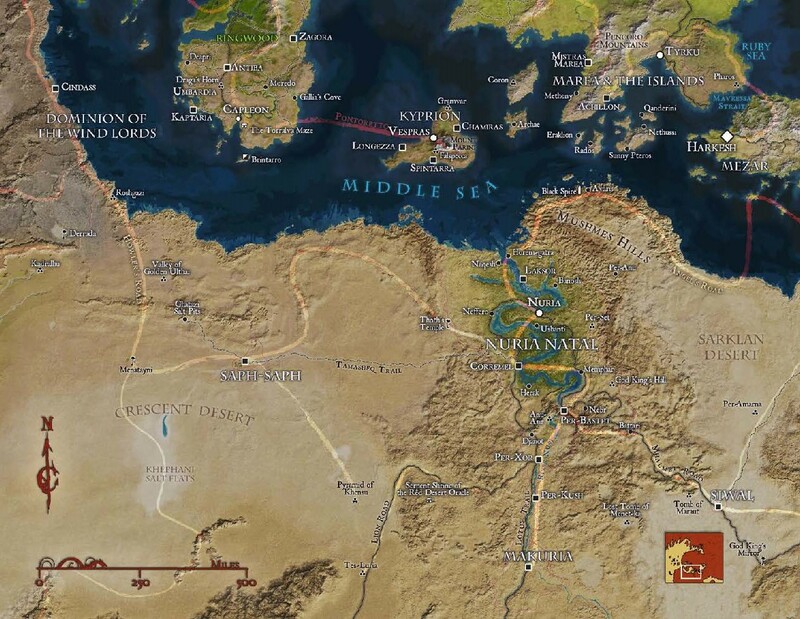 When it reaches the Middle Sea, it turns east to Efisis in the Dragon Empire, before heading southeast into Ishadia. Numerous strong and weak ley lines branch off it. The legendary Oasis of Figs drifts along these lines, appearing at a different location in the desert with each sunset. Ruled by Sultan Hajani the Benevolent from his colorful marble palace, time passes strangely at the oasis and visitors who eat the sultan’s iridescent figs often find themselves unable to leave. West of Nuria Natal, the Howler’s Road runs from the Pyramid of Khensu through the Crescent Desert to Saph-Saph, Roshgazi, and Cindass, all the way to Bemmea in the Magocracy of Allain, while the Leviathan’s Road runs south from Bemmea and passes through the Isle of Morphoi before reaching Mardas Vhula-gai in the Chelamite Mountains. Centuries ago, a group of Nurian wizards determined how to open mystic portals at various points along the ley lines. Dubbing them the Red Portals, these mages set about mastering their use. Today, the Honorable Society of Portal Wizards still exists in Per-Anu and remains devoted to studying and manipulating the portals. See the Rules Appendixes for a selection of spells created by the portal wizards. 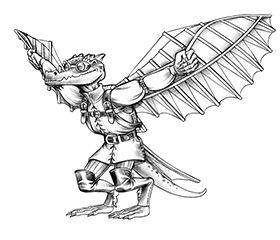 The Red Portals connect not only to the shadow roads, but also other planes, dimensions, and times, allowing the GM to create side campaigns and mysterious adventure sites without having to build an entire world. The idea is, of course, to suggest whole realms of bizarre, wondrous, magical, or horrifying alternate realities. This is a touch of world-tripping, whether Princes in Amber-style or just plane-hopping. Make it epic by playing up the bizarre, and make it clear that it is Another Time, A Distant Place through crazy accents, flashback music, a shift in lighting, or other cues that the game has moved into Other Realms. Some Red Portals are anchored to an archway, door, or other opening; others are invisible or exist only as a slight shimmering in the air. To activate a portal, PCs need to visualize themselves traveling along the shadow road just before they step through it. The Red Portals go to a hundred different destinations (if one believes the lore) or just to one (if you have a particular destination in mind). To randomly determine where a given Red Portal goes, roll on the Destinations Table below. Portals can be one-way or two-way.